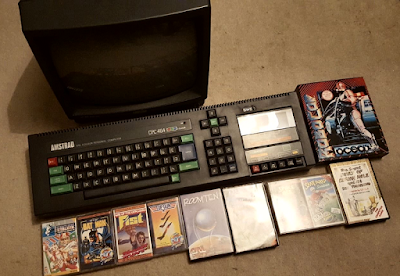 The compact, all-in-one, and rather powerful Amstrad CPC 464 8-bit micro, despite arriving late at the home computing party, did manage to carve itself a substantial fanbase throughout Europe, and have hundreds of games released for it. And, after reading this rather colourful piece on the history of the machine, you just might want to take a look at this Amstrad CPC 464 eBay auction. The computer on offer has been tested and is working, and comes complete with its very necessary (green) monitor and 10 boxed games on tape. The games include Batman, Robocop, Way of the Exploding Fist, and The Secret Diary of Adrian Mole.